1. In a large skillet, cook bacon over medium-high, stirring occasionally, until fat is rendered and bacon is lightly browned, about 20 minutes. With a slotted spoon, transfer bacon to paper towels to drain. Pour off all but 1 tablespoon fat from skillet (reserve for another use); add onions and garlic, and cook until onions are translucent, about 6 minutes. Add vinegar, brown sugar, maple syrup, and coffee and bring to a boil, stirring and scraping up browned bits from skillet with a wooden spoon, about 2 minutes. Add bacon and stir to combine. 2. Transfer mixture to a 6-quart slow cooker and cook on high, uncovered, until liquid is syrupy, 3 1/2 to 4 hours. Transfer to a food processor; pulse until coarsely chopped. Let cool, then refrigerate in airtight containers, up to 4 weeks. * Please note that this recipe makes a large batch of soup. You will need a large slow cooker. My Cuisinart Multicooker has a 7-quart capacity and gets pretty full, with this soup recipe totaling about 5 quarts. Add chicken pieces to slow cooker. Then add lasagna soup ingredients, onions through salt and pepper. Stir gently to incorporate, cover, and cook on low for 4 to 5 hours, until chicken is cooked and tender. Remove chicken pieces to a cutting board and chop into bite sized pieces, or use two forks to shred. Return chicken back to slow cooker. 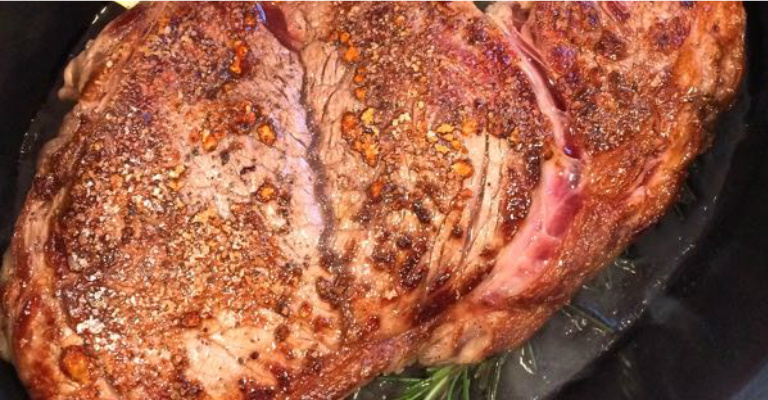 Taste and then season with additional kosher salt and black pepper if needed. About 20 minutes prior to serving, cook the pasta in a pot on the stovetop. Add pasta to a pot of boiling water with 1 tablespoon of salt added. Cook just until al dente. Do not overcook. Drain, return pasta to pot, and cover to keep warm. To serve, ladle hot soup into bowls. Stir in some of the pasta and fresh basil. Top with fresh mozzarella cubes. Finish with freshly ground black pepper and fresh Parmesan, if desired. Serve with warm fresh bread. Add fire roasted diced tomatoes, bay leaves, and chicken stock. Stir to combine. Bring to a boil and then reduce heat and simmer for 30 minutes. Add uncooked mafalda pasta and cook until al dente. Do not over cook or let soup simmer for a long period of time at this point, as the pasta will get mushy and absorb all the soup broth. You may even want to consider cooking the noodles separately, and then adding some to individual bowls before ladling the soup over them. This would be an especially smart move if you are anticipating any leftovers. Right before serving, stir in the basil and season to taste with salt and freshly ground black pepper. 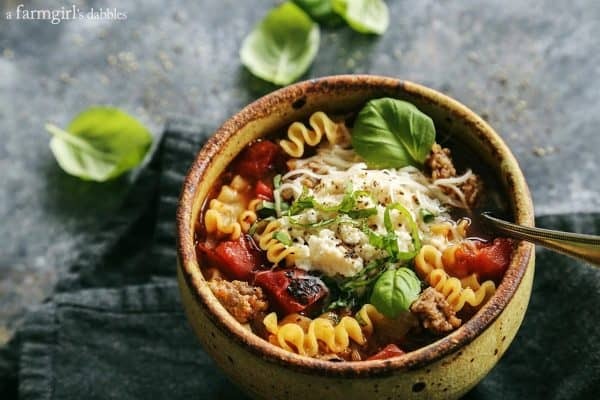 To serve, ladle soup into bowls and top each bowl with a bit of shredded mozzarella and a good dollop of the cheesy yum. Finish with some freshly ground black pepper over the top and a small scattering of fresh basil. 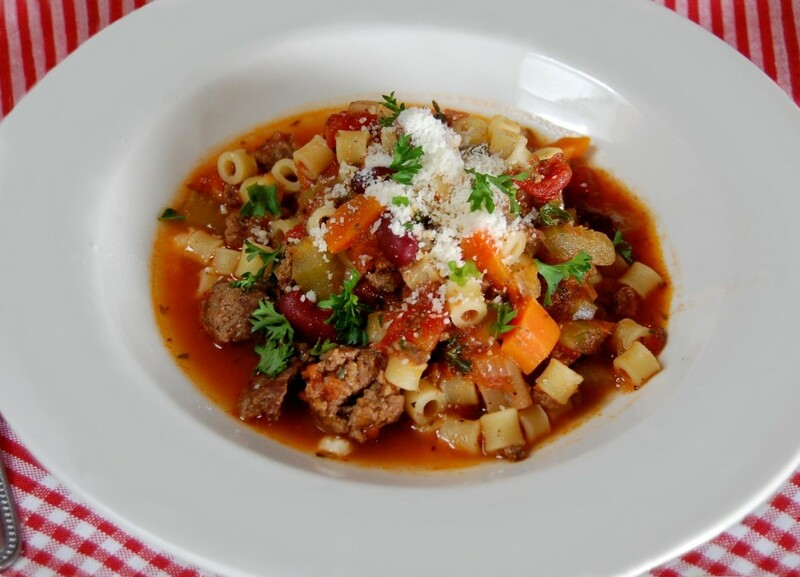 Serve this lasagna soup with your favorite garlic bread of breadsticks. 1. In a slow cooker, combine broth, tomatoes, beans, carrots, celery, onion, thyme, sage, bay leaves, and 1/2 teaspoon each salt and black pepper. 2. Cover and cook on LOW for 6 hours or on HIGH for 3 to 4 hours. 3. Thirty minutes before the soup is done cooking, add ditalini, zucchini and spinach. Cover and cook 30 more minutes. 4. Remove bay leaves and season, to taste, with salt and black pepper. 5. Ladle soup into bowls and sprinkle parmesan cheese over top. Garnish with basil, if desired. 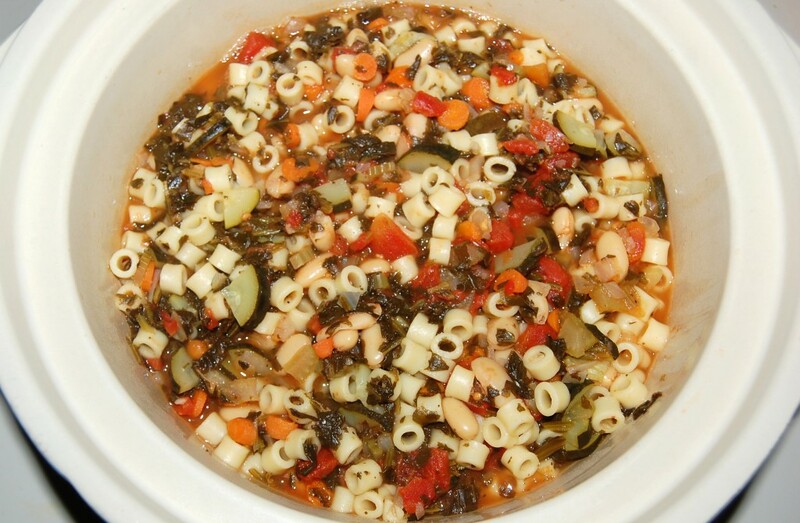 "Pasta e Fagioli" simply means "pasta and beans." 1. 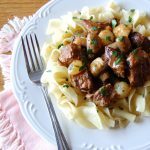 Brown beef, turkey or sausage in a skillet over medium high heat. Add to the Crock Pot. 2. Toss in chopped onions, carrots, celery, un-drained tomatoes, drained beans, beef stock, oregano, pepper, parsley, Tabasco and spaghetti sauce. 3. Cook on LOW for 7-8 hours or HIGH for 4-5 hours. 4. Cook pasta according to package directions; drain and stir into soup. Serve in bowls topped with fresh grated parmesan cheese. This slow cooker recipe for tender garlic Parmesan herb chicken gives a slow-roasted crust in a slow cooker. Use forks arranged in the bottom of the slow-cooker as a makeshift roasting tray to lift the chicken out of its juices. Rather than stewing, the chicken cooks slowly and evenly as the hot air circulates around it. What you get is a light crust and an effect fairly close to a slow-rotating barbecue grill. 1. Line a 6-quart slow cooker with 8 to 10 forks facing up or down, arranging them in a way that keeps the chicken lifted from the bottom of the slow cooker. 2. Season the chicken with salt and pepper, rubbing into the meat. Set aside. 3. In a bowl, mix Parmesan, garlic, thyme and rosemary. Sprinkle all over chicken, pressing into the meat to create a crust. 4. Gently place chicken onto the forks in the slow cooker, bone side down. 5. Cover and cook on high for 3 hours. 6. Rest for 5 to 10 minutes with lid partially open. Serve. Pro tip: For a luscious sauce, pour the juices from the bottom of the slow cooker into a pot and bring to a boil. Lower heat and simmer until reduced by half. Turn off heat and stir in 2 tablespoons of butter. You're done! This soup is creamy and amazing. It’s reminiscent of baked potato soup but the ham and onion gives it that distinct flavor of the casserole. Served this with crusty French bread. Freeze leftovers and have for lunch. 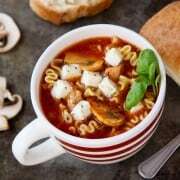 Soup – it really stretches! 1. Add diced potatoes, onion, carrot, ham, thyme, parsley, pepper & broth to a crock pot. 2. Cook on low 7 hours, or on high 3 hours if pressed for time. 3. Remove 2-3 cups of the potatoes/carrots and mash, then return this mixture to the slow cooker. 4. Add milk and sour cream. Stir and cook an additional 15 minutes. 5. Add pepper to taste. Makes twelve 1-cup servings. Quick Tip: I put some chopped scallions on top of our bowls of soup along with a sprinkle of shredded cheddar cheese. * Quick Tip: Virginia baked ham is perfect in this recipe. Get an extra thick slice from the deli and dice it up! Even ham lunch meat will work perfect in this dish. If you’re not a fan of chunky pieces of ham you can get deli sliced meat and just rip it up in there. This recipe is made with acorn squash, apples, and some other fall-inspired spices. 1. Use a 4-quart slow cooker. 2. Cut the acorn squash in half. This is hard! I’ve found the easiest way (thanks to my mom) is to microwave the squash for a minute on high to soften the skin. Then use a knife to cut it right down the middle. Scoop out the seeds (which guinea pigs don’t like for some reason) and discard. Put the squash into an empty slow cooker, skin side down. 3. In a small mixing bowl, combine the cut up apple, melted butter, brown sugar, walnuts, salt, and cinnamon. Scoop this concoction into the acorn halves. 4. Lick the spoon. Cover and cook on low for 5 hours, or on high for 2 to 3. Soft, cinnamon apples, crumbly and addictive topping. This apple crisp has caramel too which puts it over the top. This is one of those desserts that you take a bite and just hold it in your mouth for a bit and savor. The caramel hardens a bit and makes the consistency perfect. It’s like a candy bar and classic apple dessert all in one. In a mixing bowl, mix together brown sugar, granulated sugar, apples, salt, and cinnamon. Spread onto bottom of slow cooker. Mix your crumble topping ingredients until it’s incorporated. Sprinkle it over top of the apples. Cook on low for 4 hours, or high for 2 hours. Turn off the slow cooker and let sit, covered, for one hour to let the caramel get thicker. It’s better to peel the apples, but truly you could leave the peel on and it’d be delicious still. In 6 1/2-quart slow cooker, mix stew meat, tomatoes, beans, carrots, onion, pepper and broth. Cook the juices down in a separate pan to make a glaze. Serve over Jasmine rice or other starch. Once pork tenderloin has cooked, remove from slow cooker with tongs (or slotted spoon)into a serving dish. Break apart lightly with two forks and then ladle about ¼ – ½ cup of gravy over pork tenderloin. Caramelizing onions makes them sweet tasting. With this recipe there's no need to stand over the stove & caramelize the onions in a saucepan. Usually, the saucepan is not big enough to make several servings of onion soup. This is where the crockpot comes in handy. Melt the cheese and add a salad for a easy planned dinner. Put the onion slices in a 5-quart (or larger) slow cooker, along with the butter, olive oil, salt, and black pepper. Cover the crockpot and cook on low overnight, or for 10-12 hours. The onions should be dark golden brown and soft. Season to taste with additional salt and pepper, if desired, and stir in the brandy, if using. In evenly-portioned amounts, ladle the soup into oven-safe bowls. Place the bowls on a baking sheet to catch any spills while in the oven. Top each bowl with a baguette slice and the shredded Gruyere. Bake for 20 to 30 minutes, until the cheese is completely melted. Turn the oven to broil and brown the tops for 2 to 3 minutes, or until the cheese is bubbling and browned. Remove from the oven and let cool for a few minutes before enjoying! Serve with creamy, mashed potatoes or add potatoes cut up in small chunks about an 1-2 hours before steaks finished the cooking process or serve it over egg noodles with some green beans. In a large bowl, mix together the ground beef, onion soup mix, bread crumbs, and milk using your hands. Add Worcestershire sauce to the meat for added flavor. Shape into 8 patties. Do not over mix beef mixture or it will become tough. Handle steaks with care or they will fall apart. In a medium bowl, mix together the cream of mushroom soup, au jus mix, and water. Optional: Add chopped onion to mixture. Add mushrooms for a different flavor or texture. Cook on the Low setting for 4 or 5 hours, until ground beef is well done.